Built in 1905, the branch office of the Nederlandsche Bank originally domiciled here on Boompjes was devastated in the 1940 air raid. The present branch was erected in 1955 at almost the exact spot occupied by its predecessor. Its mute features have a traditional architecture of brick facades, a bronze-pillared monumental entrance and a set-back copper roof structure. Next door to the former bank building is a 20-storey office tower designed by Philip Johnson and Alan Ritchie. A tower of luxury apartments courtesy of 01-10 Architecten is to rise behind and half above the bank building. 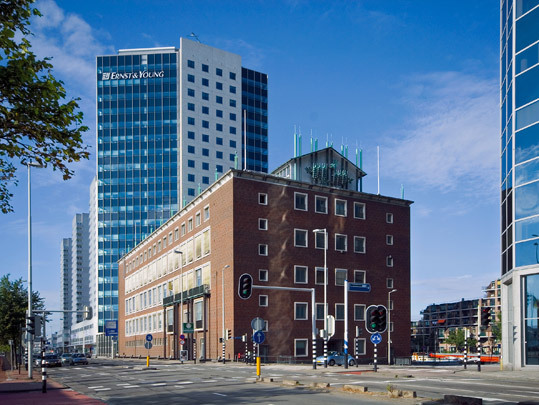 The original building is renovated as office building De Nieuwe Boompjes.